It's another day of double fun challenges. If you are here looking for Truly Scrumptious just scroll down after here and take a look. The Pixie Cottage this week is going green! Not Earth green but the color green. Here's a chuckle...my friend Tracy and I have what we call play dates. If you have visited me before you know all about them. Well this past Sunday I was at her house and we got to talking about what we were working on for challenges and she said, " I noticed that alot of challenges are for green, why??" I thought she was pulling my leg. It really didn't hit her that St. Patty's was around the corner...She had a DUH moment. My sweet little Maggie is sitting on the Stump by Sandra Hammer. She is one of Pixie Cottage's designers. 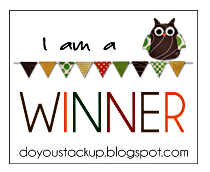 It can be found here along with other great stamps that are great for Magnolia stamps to play on. Come go green with us at the Pixie Cottage. Can't wait to see what you come up with. Awww....totally ratting my stupid duh moment out!! LOL Love the card! Wow how adorable I love this card!!!!! 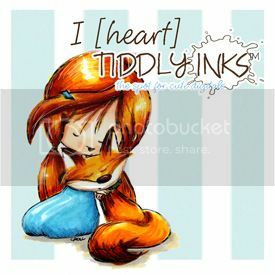 Awww...this is so sweet! What a pretty background for your gorgeous Tilda! Adorable card!! Love the colors and your coloring is superb. I'm loving the scene you created as well. Love the Pixie Cottage images. Thanks so much for sharing!! What a cutie Lisette! Love your design and coloring! Awesome card!! Totally awesome card, Lisette! Tilda looks wonderful in green. Your scene is amazing!! I love your coloring!! Hugs, Rosemary. A very pretty and sweet card Lisette! The shades of green are soft and lovely, and I like the scene you created! your card is gorgeous. Love your coloring and that tree stump and seat looks great. Great greens. Pretty scene. Love the flowers. This is adorable. Love the background. Oh so beautiful and super sweet as well!!! Great paper, great scene. Coloured gorgeously! Thank you for joining our Magnolia-licious Challenge Blog. Okay Miss Lisette - another one of your gorgeous creations!! I love the stump and the flowers and your coloring is wonderful! Oh Lisette!! 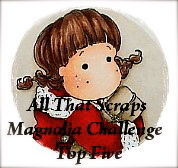 I forgot to tell you "Thanks for joining us at Magnolia-licious Challenge blog!!" Hope to see you next week! so sweet Lisette and love the sentiment! 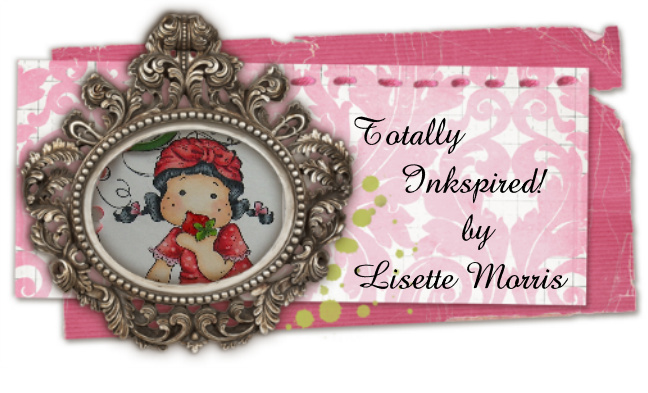 Hi Lisette....I have been having a good nosey round your blog to check out everything I have missed since I have been away...so many gorgeous projects to look at!! Love this one...that Tilda is gorgeous and so beautifully coloured!!! Love the green too!! What a lovely card.... I love it. Hi Lisette, i'm just catching up on cards posted to the group *blush*! I love your card! I love the scene you've created and the colors you used. Tilda looks beautiful!